Hey, everybody. College starts in two days for me so I've been trying to decide which books from my to-read pile I should take with me. 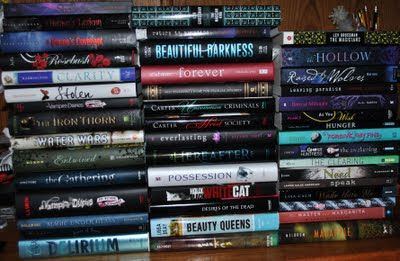 Some of these have been in there since January, hell even October or sometime earlier for Beautiful Darkness--I remember it being on my shelf for a while last year and I still haven't finished it. Anyways... this is essentially "my mailbox" [like the meme hosted at the Story Siren] (excluding NetGalley titles. Add 10+ more books ><), and I was wondering if there any books which you'd like to see me review... or which you particularly recommend. Please help :). Yep. It's a lot of books. Some I bought, some I got from the RT Convention a while back. But either way, I can only take maybe 6 of them with me. Help me choose... pleeeasee?? The Magicians & The Magician King, Delirium, Miss Peregrine's Home for Peculiar Children, White Cat, Shade, As You Wish annnnd Clarity? Some of these I've read, some I haven't. But if I haven't, I'm looking forward to them. So many books! I'm jealous! I enjoyed Clarity and really LOVED Heist Society. And I think Speak is one of those ones everyone should read. Good luck! Here's my IMM, if you want to check it out. I'd love to see you review Beauty Queens! I haven't read it yet, but it's in my TBR pile as well. As for books I have already read, I recommend Heist Society! oh wow thats alot of books. I enjoyed The Hollow, Forever, Hereafter, Need, Wake Unto Me, Shade, Return to Paradise, and Desires of the Dead are all great books. I am in love with the Body Finder Series and the Need series..think you would love them. Uh- wow! So many books. Thanks everyone for all your recs :). I ended up taking: DELIRIUM, THE HEIST SOCIETY, BEAUTY QUEENS, SPEAK, MISS PEREGRINE'S, ROSEBUSH, WHITE CAT, STOLEN, & THE MAGICIANS. 3 more than I thought I could, but squishing 'em together worked :). @Brooke - nahhh, the pile should inspire you!! More reading XD. Never, never enough! And you'll always have something on hand :). OMG. 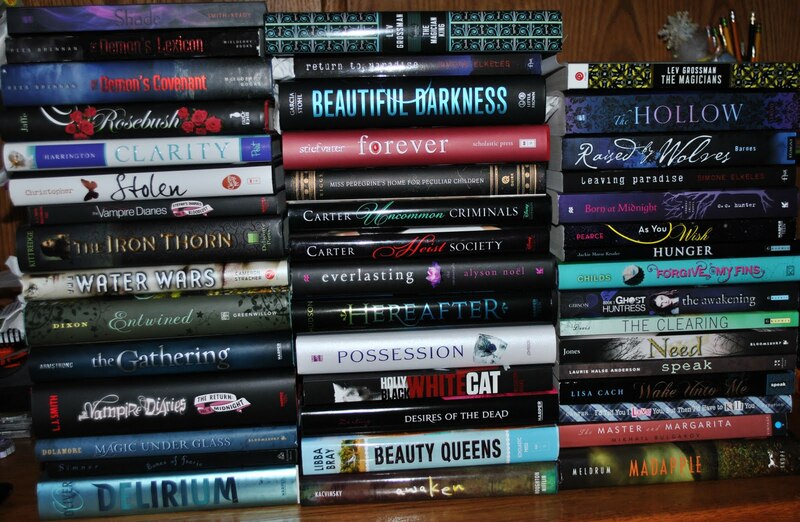 that is a ridiculously LONG TBR pile! like, scary-long, lol. Oh my Colin Farrell, where did you get so many awesome books? I'm so envious of you right now! :) I haven't read many of these, but I'd recommend The Gathering, because Kelley Armstrong is a very good writer and the supernatural world she takes you in is very intriguing and a pleasure to read about.